SUMMER TRAVEL - What's in your Rolling Tote? and for lack of room, I've included a tuna and a chicken snack boxes. If I'm going for 2 days or longer, I don't go anywhere without my Hamilton Beach K-cup pot, bottled water (those little 8 oz. chub jugs are perfect for single serve cups). The Baby Wipes Box has an assortment of K-Kups then I also have my Mocha Latte cups. I make frequent visits to my local quilt shop, The Hideaway Quilt Shop, in Birch Tree MO. The owners and I have become good friends over the years. When I stopped by yesterday Jean told me about a new Shop Hop to take place from June 21 - September 8. What a Shop Hop this is going to be! If you are not familiar with a Shop Hop, here's the quick scoop. A group of quilt shop owners plan an event to take place over a set time period. Each shop offers individual specials, and spotlights new fabrics and products. Often times there is a prize if you have your 'passport' validated at every shop involved. I traveled through a Shop Hop back in 2011. You can see my post HERE. But this Shop Hop is going to be different from any I've ever been on. Row by Row Experience began in 2011 with 20 shops participating and has grown to include over 2500 shops covering all 50 states and some in Canada! Each shop will have a FREE pattern for a 'row block' they've designed. Many will have kits for their unique block available. The Hideaway Quilt Shop will be participating for the first time. Jean designed this cute little parade of ducks for her row. 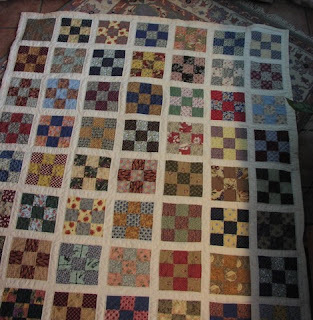 She wanted something that would be perfect for even the most novice of quilters. Aside from having the FREE pattern and kits to sell she says shoppers can also select fabrics to make the row their own. Another part of this unusual shop hop is the opportunity to collect fabric license plates. Each shop has created their own Vanity Plate that makes theirs unique. Although for example a shop in Maine might have Quilty Pleasure for their vanity plate, the Missouri version belongs to The Hideaway Quilt Shop. Shops will offer a variety of specials throughout the event. Jean will be rotating 20% off various items and doing demonstrations of techniques. So what happens when you have all these lovely fabrics, patterns and completed rows? Each shop will be giving away 25 fat quarters to the FIRST PERSON to bring in a completed quilt made from a minimum of 8 different rows by October 31st. 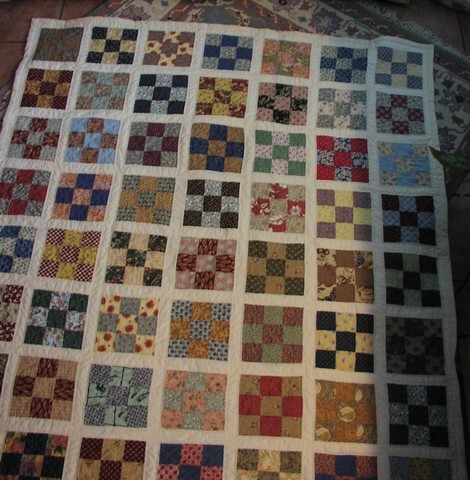 The quilt must be quilted, bound and labeled. While I won't be visiting all of the shops on the hop, I am going to look over the list and see how many I can cover near to me. I've already spied one on the list for Collinsville IL - yet another incentive to attend the stamp show there in July. Maybe next year I can wait til fall for my Texas trip and visit a few of those on my travels. If you take part in any of this shop hop, I'd love to hear from you and see pictures of the quilts you make. GETTING BACK ON TRACK - Schedule It! This is what my original blog scheduling board looked like. A full sheet of poster board, grid off to accomodate the specific blogs as well as dates to post. While I liked being able to see what I had posted and for which days at a glance, I hated having to recreate this every month. So I created this! I used the same size of sheet of white foam core, gridded off and color coded to match my blog notebook (where I jot ideas for upcoming blog posts). Then I covered the entire thing with clear contact paper. I use the color-coded strips of post its with repositional adhesive. As I schedule a post, I mark it on the blog board. For now, this hangs on the front of the upright freezer across from my temporary desk. But I already have a spot picked out for it in the new office. At the end of the month, I strip the post - its off and start fresh... except for the ones that repeat such as WOYWW for this blog and The Party List for the music blog. How do you keep your blog posts organized? Labels: Blogging, Organization, Schedule It!